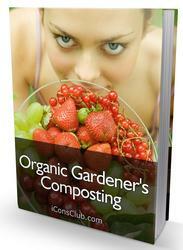 Composting is an aerobic process where microorganisms break down organic matter. During this process carbon dioxide, heat and water are produced (Fig.1). It is a dynamic process carried out by a rapid succession of mixed microbial populations. Under optimal conditions, composting proceeds through three phases: 1) the mesophilic phase with moderate temperatures (below 40°C) lasting a few days, 2) the thermophilic phase characterised by high temperatures (40-70°C), which lasts from a few days to several weeks, and finally 3) the cooling and maturation phase lasting from weeks to several months with temperatures from 40°C to ambient temperature (Fig.2). 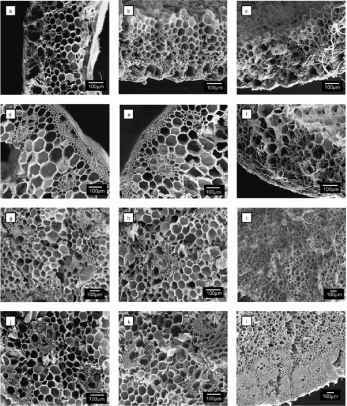 The three phases affects the material and the microbial biomass differently. Stentiford (1996) suggested that temperatures greater than 55°C maximise sanitation, whereas temperatures between 45 and 55°C maximise the biodegradation rate, and microbial diversity is maximised with temperatures between 35-40° C.
The main components of the organic matter are carbohydrates, proteins, lipids and lignin. The capacity of microorganisms to assimilate organic matter depends on their ability to produce the enzymes needed for degradation of the substrate (Tuomela et al., 2000). The more complex the substrate, the more extensive and comprehensive is the enzyme system required. Availability of carbon is essential for most microorganisms as carbon serves as an energy source and additionally is incorporated into their cells. Nitrogen as well, is a critical element for microorganisms because it is a component of the nucleic acids and proteins necessary for cell growth and functioning (Tuomela et al., 2000). 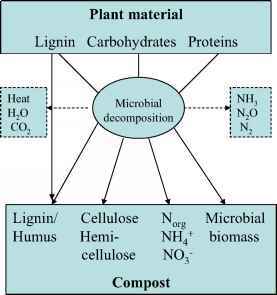 Different communities of microorganisms predominate during the various composting phases. Initially composting is dominated by mesophilic microorganisms which break down the readily available carbohydrates such as monosaccharides, starch and lipids (Tuomela et al., 2000). Klamer and Baath (1998) observed a pattern of a fast increase in microbial biomass immediately after the composting process started, followed by a gradual decrease. This could partly be explained by the availability of carbohydrates as follows: Initially fresh substrate was colonised rapidly but as the easily degradable substrates became exhausted a gradual decrease in microbial biomass took place (Klamer and Baath, 1998). Thus, the community structure during this phase is dependent on the chemical composition of the material to be composted as well as physicochemical parameters such as oxygen content, pH and water content. Additionally, the fast increase in temperature during the initial phases of composting is also responsible for the decrease in microbial biomass (Klamer and Baath, 1998). Figure 1. Microbial decomposition - from plant material to compost. Decomposition of plant material during composting is conducted by microorganisms releasing water, CO2 and heat. Depending on the composting conditions losses of nitrogen can be seen during the process. Generally, a mixture of bacteria and fungi is seen in this initial mesophilic phase. Due to the activity of these a rise in temperature to thermophilic conditions occurs. 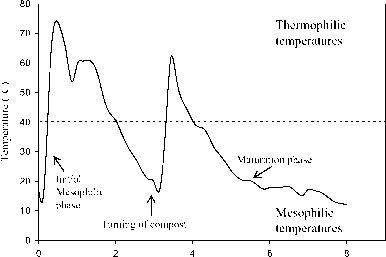 As the temperature exceeds 40°C the mesophilic microorganisms become less competitive and are replaced by thermo-tolerant or thermophilic microorganisms. In this thermophilic phase the dominating microorganisms are actinomycetes and species of gram-positive bacteria. Gram negative bacteria and fungi appear to grow only below 50°C (Klamer and Baath, 1998). During the thermophilic phase, the high temperatures accelerate the breakdown of proteins, fats, and complex carbohydrates. Generally, the greatest weight losses are seen during this phase with high temperatures (Bernal et al., 1996). When the amount of these high-energy compounds becomes in short supply the compost temperature declines and dominance is once again among the mesophilic microorganisms. During the thermophilic phase, fungi, yeasts and streptomyces survives as spores or other dormant structures and re-colonisation proceeds when temperature has declined again. Some microorganisms can survive at the edges of the compost pile as temperature remains lower there; others again are introduced to the compost from the air (Ishii et al., 2000). Figure 2. Temperature development during composting of plant residues. Turning the compost can result in a second peak of thermophilic temperatures. The last phase, the maturation phase, is especially controlled by fungi which are capable of breaking down more recalcitrant compounds. In addition, decomposition of some of the plant material can occur several times throughout the composting period. First it is degraded as plant material and subsequently as decomposition of microbial biomass by other microorganisms. The composting process is considered finished when maturity and stability of the material is reached. Maturity refers to the degree of decomposition of phytotoxic organic compounds produced during the active composting phases and is associated with plant-growth potential, whereas stability refers to the level of microbial activity in the compost (Benito et al., 2003). Maturity and stability are often used as synonyms as both are used to define the degree of decomposition of organic matter during the composting process. Stability is generally determined by O2 uptake rate, CO2 production rate or the heat released due to microbial activity. Maturity has been determined by biological methods such as seed germination index, by physical properties such as odour and colour and by chemical parameters such as C/N< 12, NH4/NO3" < 0.16 and water soluble carbon < 1.7% (Bernal et al., 1998; Eggen and Vethe, 2001; Benito et al., 2003). However, whether either of these indices can be used is highly dependent upon the material to be composted. Temperature is a significant factor in determining the relative advantage of some species over another, and is thus the dominant physicochemical parameter controlling microbial activity during composting. However, bacteria proliferating during the composting process also differ with the materials treated. The bacteria appearing during the composting process might have been absent initially or at least representing minor populations in the starting material. Thus, the microbes multiplying in the composting process would be adapted to the composting environment and selected by factors within the composting materials (Ishii and Takii, 2003). The level of composting progression may also be reflected by the amount of dissolved organic C available throughout the composting period. Molecular determination of the microorganisms has revealed differences in microbial species present between the two low temperature phases; the mesophilic and the maturation phase. This suggests that temperature alone does not control the microbial proliferation (Ishii et al., 2000), and the differences in microbial species between the two low-temperature phases was observed as being due to carbon source, pH and the concentration of organic acids and humic substances present (Ishii et al., 2000). Turning the compost during the maturation phase could result in reactivation of the degradation process. This could be explained by incorporation of less decomposed material from the exterior, thereby providing fresh substrate for the microbial biomass (Garcia-Gomez et al., 2003). Additionally, turning the compost affect the microclimate within the compost, altering parameters such as the aeration and moisture content. Finally, mechanical disturbance of the compost could also change the structure of the material and alter microbial communities resulting in increased activity. Thus, turning of the compost could be used as means of producing a homogeneous product and ensure sanitation of all the material.